WiFi is awesome... until it's not. WiFi is an increasingly important part of our home and office. But when something goes wrong, it's a mystery to fix. Every minute of network downtime is money down the drain. Which rooms have good WiFi coverage, and which don't? Am I on the best channel for good coverage? What other devices are transmitting in my environment, and are they interfering? These questions are not always simple to answer. Since WiFi is invisible, it's not so easy to check and see if your fix ended up working. What if you could easily answer these questions in under a minute using software that explained the hard numbers in an easy-to-understand way? "inSSIDer is like a Swiss Army Knife for WiFi troubleshooting." inSSIDer is WiFi optimization and troubleshooting software that takes WiFi network discovery to a whole new level. With a quick glance, you'll be able to find poor channel placement, low signal strength, and RF interference in the 2.4 and 5 GHz bands. 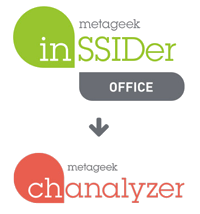 inSSIDer comes in two versions: inSSIDer 4 (Windows & Mac OS X), a home-use WiFi scanner, and inSSIDer Office (Windows & in Beta for OS X), which adds extra troubleshooting power like RF spectrum analysis, expert analysis, export to Chanalyzer, and network drilldown, to name a few. Data provided by inSSIDer will help you make educated decisions about channel and access point placement, so you can create a more reliable network without formal training. "Which channel is best? Is channel 4 okay? Who knows?" Take the guesswork out of channel selection. inSSIDer shows you where the best channel is once and for all. Stop sabotaging your setup by causing your AP's to overlap. You'll be able to visually see which networks are on which channels, so you can avoid competing with your neighbor's network for precious bandwidth. In addition to channel-by-channel stats, inSSIDer's channel recommendation algorithm has been redesigned to handle multiple radios within the same network, making channel planning on a multi-AP network simple and accurate. The Channels Graph shows you which parts of the WiFi bands are crowded and which are open, so you can make an educated channel-planning decision. 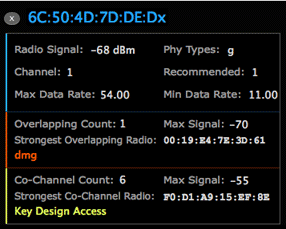 This network is on channel 4, which is a crowded channel that's non-standard for 2.4 GHz. Channel 11 is wide open though, and now that you know, you can go to your router's config page and change the channel. Do you manage more than one AP? With inSSIDer you can look at your network at a logical ESSID level, or by individual radio in the Physical grouping view. 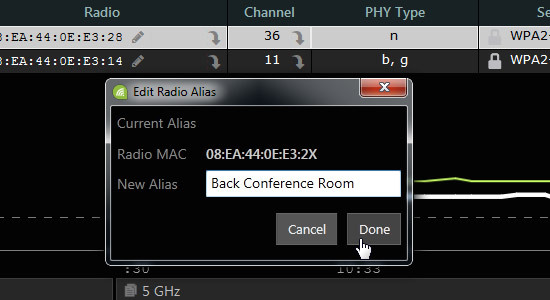 With new features like network drill down and the ability to alias your AP's radios with a new name (inSSIDer Office only), you can see the information you need at a glance. In addition to the channel-by-channel WiFi & RF statistics in the Channels view, inSSIDer's channel recommendation algorithm has been redesigned to handle multiple radios within the same network, making channel planning on a multi-AP network simple and accurate. WiFi is probably one of the many hats you wear every day. You might be the jack-of-all-trades IT person at a small company, or just the "techy" one in the family trying to stream the latest Game Of Thrones episode with surround sound to your wireless speakers. Either way, you don't have a lot of time to spend on learning everything there is to know about WiFi. With inSSIDer Office, you won't need to, because it has built-in helpful recommendations and tips to show you what you're looking for and how to fix the problems that you do find. With just a few clicks, you can get channel recommendations as well as expert advice so you can create a reliable network in minutes. If inSSIDer Office discovers that your network isn't using optimal security and network settings, it will alert you and suggest changes you can make to make your WiFi faster. When you select a network in inSSIDer 4, you'll immediately see a signal strength graph, which goes up and down as you move further or closer to the router. If you see inSSIDer's signal strength graph dip too low, you'll know that you need to move either your device or your router for better connectivity. The Signal Strength Graph is an easy way to visually track RSSI, or signal strength, over a length of time. Desired signal strength for optimum performance varies based on many factors, such as background noise in the environment, the amount of clients on the network, what the desired data rates are, and what applications will be used. For example, a VoIP or VoWiFi system may require much better coverage than a barcode scanner system in a warehouse. WiFi is generally measured with dBm, with is not an absolutely value, being logarithmic instead. A 3 dB gain means twice the signal strength, while a 3 dB loss halves the signal strength. Keep this in mind when setting signal strength requirements. Note: The numbers in this chart are suggestions only. The desired signal strengths will vary, based on the requirements for the network. -30 dBm Max achievable signal strength. The client can only be a few feet from the AP to achieve this. Not typical or desirable in the real world. -80 dBm Minimum signal strength for basic connectivity. Packet delivery may be unreliable. -90 dBm Approaching or drowning in the noise floor. Any functionality is highly unlikely. inSSIDer 4's Details Pane gives you crucial information about your selected network, including Min and Max Data Rate, router manufacturer, and stats about the two networks most likely to conflict with your own, so you can make an educated decision about router placement in your environment. There are two versions of the Wi-Spy USB-based spectrum analyzer: The legacy 2.4 GHz-only Wi-Spy Mini, and the future-proof Wi-Spy DBx that analyzes both 2.4 GHz and 5 GHz bands. Both devices are small enough to fit in your pocket, and when combined with inSSIDer Office, allow you to see the frequencies and channels where possible interfering devices are operating. "Being able to see the RF spectrum is huge. I can see all types of interference, not just WiFi devices." Out of the box, inSSIDer Office is easy to use for network spot checks at a customer site. But what if you discover an issue, and want your company's WiFi guru back at the office to check it out? Instead of sending the WiFi expert to every single customer site along with the technicians, you can now capture on-site recordings with inSSIDer Office, then export them as a .wsx file for later analysis in our professional level tool, Chanalyzer. Your team lead back at the office can then fire up Chanalyzer, review recordings remotely, and solve the issue quickly without ever leaving their desk. Which Version of inSSIDer is Best for You?